I have decided to join another challenge. This time it's The Debutante Ball 2010 Reading Challenge hosted by Jen – Devourer of Books and Swapna – S. Krishna’s Books. I am so excited about this challenge, and I just wish I had thought of it. 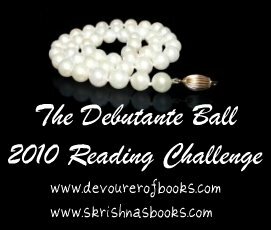 I am a huge fan of The Debutante Ball, and all of the Deb's books that I've so far have been awesome! * Change your level of commitment – in fact, we hope you’ll love these books so much that you’ll decide you want to read all of them! Since it seems like I'm signing up for a lot of challenges, I am going to start small with this one (well not that small since I am signing up for both parts of the challenge.) I can always bump up and read more books if time permits! For The Current Debs Challenge, I am going to read 3 books; and for The Previous Debs Challenge, I'm going to try to read 4 books! I've read quite a few of the Deb's books over the past few years and I've never been disappointed. This challenge should be terrific -- come and join me! This is absolutely on my list for next year. I need to get organized! Hooray! I'm so glad you're joining us Julie! I'm seriously chomping at the bit to start reading books by this year's Debs! This is one of the challenges I'm seriously considering. I've got to get my stuff together and figure things out. Have fun with it! I already have Sarah Pekkanen's THE OPPOSITE OF ME on my TBR; I'm going to check out the other titles. I'm so glad you've joined!